Ever since I got my hands on Kajsa's book, "Scandinavian Stitches", I've had my eye on her quilted baskets. With a little wire as the secret ingredient, her simple design means that you can make very large fabric baskets that still they hold their shape pretty well. 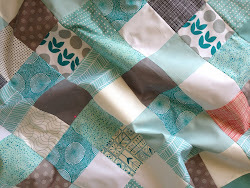 Yes, I knew I wouldn't be able to resist those quilt scraps for long! This is the seventy-four year old quilt, reincarnated as a lovely large, nice soft basket to hold whatever we need it too. At the moment, it is Tilly's toys that are taking over the living room -- so, into the basket they go! How lovely to have something so old, and with so much history, not only on display, but being useful. And, in case you're wondering just how big our big basket is, I made it 13 x 13 inches, which is the perfect size to fit into an IKEA Expedit bookcase! 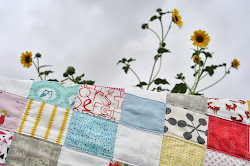 I love big baskets and this is so special that you could use that quilt! And I also love that cute felted (?) red and green ball, did you make that? Debbie -- I just couldn't wait! The idea of not using them until after England was unbearable! Kathryn -- yes, I made the little felted balls. Really easy knitting pattern in "Knitting for Baby", and Tilly loves them. Carin -- thanks for stopping by! Baskets are so handy, aren't they... especially giant ones! You are fast! What a beautiful and functional way of using something this special. Lovely basket but can I have one sans bubba please? Makes me want the book EVEN MORE - I'm still waiting for it to arrive and understand it's not going to come till apres Christmas now. Jadyn, I love having it out and in daily use... stored away would be no fun! Yes, it's a great book -- highly recommended! And not just Christmas stuff... so don't worry that it will be late!